Shiloh Road Kennels is located in a country setting south of DeSoto and Cedar Hill, Texas. 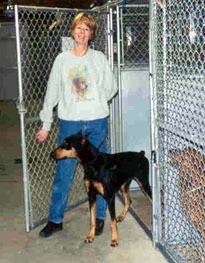 The kennel is composed of modern, sanitary runs in sizes to meet the needs of every dog. The indoor/outdoor runs allow dogs to go outside or come into a heated/air conditioned area. Inside runs are separated by solid metal panels to allow for privacy. Outside runs are separated by chain link fencing. The runs are topped with chain link fencing for your pet's security and the entire kennel is surrounded by a perimeter fence which provides a large exercise area as well as a barrier for would-be escape artists. The outside runs are also shaded. Our policy is that all dogs leaving Shiloh Road Kennels will look better than when they arrived. All dogs are brushed and ears cleaned before going home. We have found that your dog will do better if you bring his regular food from home. We can provide a high quality kibble for an extra daily charge. We will happily accommodate special diets. Fresh water is available at all times. Separate accommodations are provided for your feline companions. Medications will be administered as supplied by the owner. 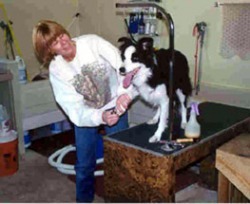 In case of emergency, veterinary services are available on a 24-hour basis. We guarantee the best in care for your pet. If for any reason our clients are not satisfied with our services, no fees will be charged. MAY 2017- There has been an outbreak of a highly contagious dog flu in Texas and adjoining states. We are now requiring the H3N2 vaccine which is a series of two shots. The shots are administered two to four weeks apart. If you are unable to obtain the first shot or complete the series of vaccinations prior to your need for boarding, be aware that if your pet were to develop symptoms of the flu, it would need to be taken to an emergency veterinary clinic or picked up by you or your representative immediately. This is for the protection of all the dogs boarding at the kennel. Less than 30lbs $20, 30 to 79lbs $22, 80 to 99lbs $24, and 100lbs plus $26 . If two family dogs are in the same run, the cost is $2 less per night what it would be if they were in separate runs. For the Kitty Condo it is $20 a night. Any pick up after 10 AM is charged for that night. The run is 3'x4, 4’x4’ or 4'x5' on the inside and 3'x12' , 4'x12' or 5’x12’ on the outside. The size somewhat is determined by the weight of the dog and how busy the kennel is at the time of the board. Proof of vaccinations is required which includes the bordetella (kennel cough). Dogs must be relatively clean, no fleas or ticks and on a flea and tick preventative. You may bring a bed or blanket or rent a hammock bed. We have found that dogs do better on their own food. Please bring your own food. It needs to be in an air tight plastic container with their name on it. Everything you bring needs to have your name on it including cans of food. During the summer the inside portion is air conditioned. We periodically let the dogs out to the outside section of the run to exercise. Then late at night when it cools off, the kennel is opened up so the dogs can go in and out. We have ceiling fans and large floor fans that continue to run at this time. Depending on the temperature, the runs are left open part of the morning and then the a/c is turned on again. We feed once or twice a day depending on what the owner requests. Fresh water is provided at all times. The kennel is cleaned from the inside out after the morning feeding. The outside is cleaned periodically through out the day. For an additional charge of $5 you can have your dog walked on leash or let out in a supervised fenced area for 15 minutes. Baths are available for an additional charge also. All dogs are brushed, ears and face cleaned before leaving to go home. Please make sure your dog is on a flea preventative. Our business hours are M-F 8AM to 10AM and 4PM to 6PM by appointment. We are open Saturday 9AM to 10AM and Sunday from 5PM to 6PM. We are closed for drop offs and pick ups on Thanksgiving, Christmas and New Years Day. The dogs are taken care during this time. If you have any other questions or would like to make a reservation please call 972-723-3880 or email Shiloh@aircanopy.net. We take checks or cash only.